You may (or may not) have noticed that I failed to post in December, and in doing so failed with my resolution. The stated target of at least 1 post a month was actually less that my real intention and deliberately set so that I could not fail! However I did not fail by much, but there were also a few other times where I was cutting it fine at the end of the month. I have already stated my lack of trust in specifically ‘new years’ resolutions but just recently I have realized why they are doomed to failure, at least in the more wintry parts of the northern hemisphere. The common resolutions are particularly difficult. Try the ”start an exercise regime.’ If you have a traditional full-time job then the only way you will find the time for this is to either get up earlier (when it is dark and cold) or go after work (again when it is dark and cold!) These are not exactly the best conditions for forming a new habit. The diet resolution fairs no better. We want to cut down on our carbohydrate/sugar/fat intake at just the time of year when our bodies crave them most for the energy to keep us warm and comfortable through the winter months. These would have a much better chance of success if we made them 3 months later when sunlight and vitamin D levels are on the increase, or before the winter gets started so the habit has time to form. Time to bring it back round to the model railway. 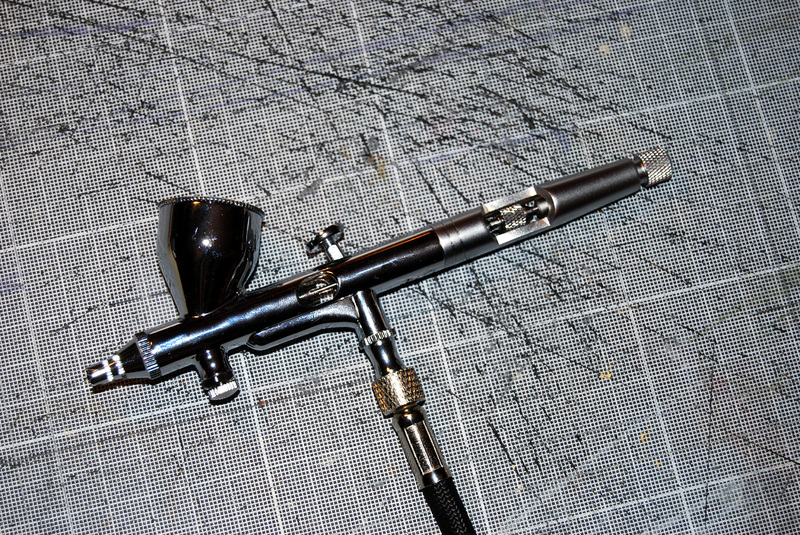 Here is my new toy – an airbrush, a Christmas present from my wife. The hope is that it will lift the quality of my model making by increasing the number and consistency of the painting and weathering effects I can achieve. It is a reasonably high quality dual action gravity feed type, and but I am not yet ready to make the significant financial investment in a compressor as well, so I am hoping to utilize readily available aerosol propellant. Already however there are problems. Although I have had a little time, I am yet to test it as I am unable to procure a suitable adapter to connect the hose to my propellant can. The hose I have that connects to my airbrush does fit properly to the aircan adapter. The available hose that does connect to the air can does not have the correct connection at the other end, and it is as expensive as the airbrush itself! … and again I resolve to try harder and to spend more time both model making and updating my blog. A very quick post this time, just to keep my resolution of at least one post per month. There is not much that is new to report, but I thought an overall view of progress would be worth while. You may remember that I after my original decision to reduce the upper level height without dismantling it, I did eventually dismantle it in order to paint the roads. I have eventually finished the road markings (at least under the bridge) and properly reinstated the upper level and rewired the trackwork. After many months of neglect the track needed a good clean (necessitating the purchase of a Peco track rubber), but now the small bit that there is works like a dream. .. hopefully not what your experience is of reading this blog, but what I have been doing this month. I have been experimenting with brick colouring and painting techniques trying to reproduce the look and feel of a typical section of Berlin Stadtbahn. My prototype is the stretch along Dircksenstrasse between Alexander Platz and Hackescher Markt seen here courtesy of Google. 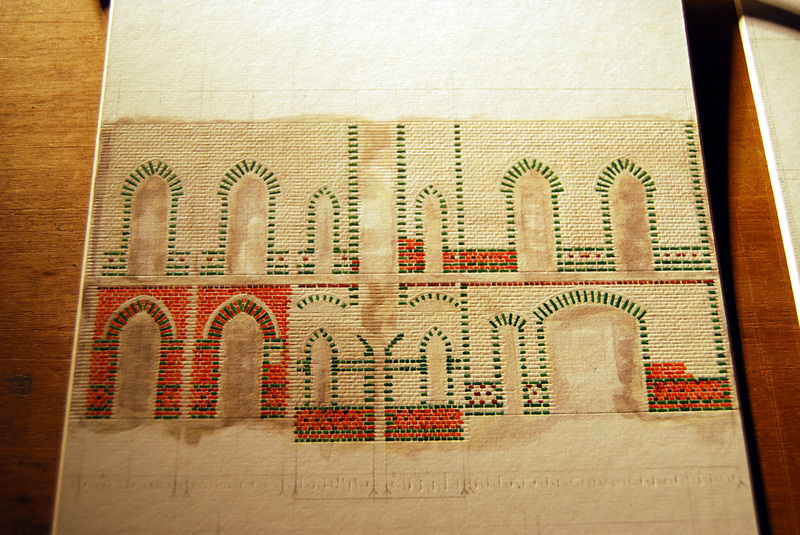 This has been particularly difficult because of the relative colours of the bricks and mortar. Due to the weathering of the lime mortar it is mostly darker than the sandy coloured bricks. This has presented two problems; the first of which has been trying to get a good match for the exact brick colour. This has involved mixing paints, something I am reluctant to do for large areas of brickwork. It will be impossible to paint all the bricks in one hit, and it is because it is difficult to mix paint the exact same colour twice, the resulting effect can look patchy (look at the stripy effect on the town hall roof, as each strip has been weathered differently). 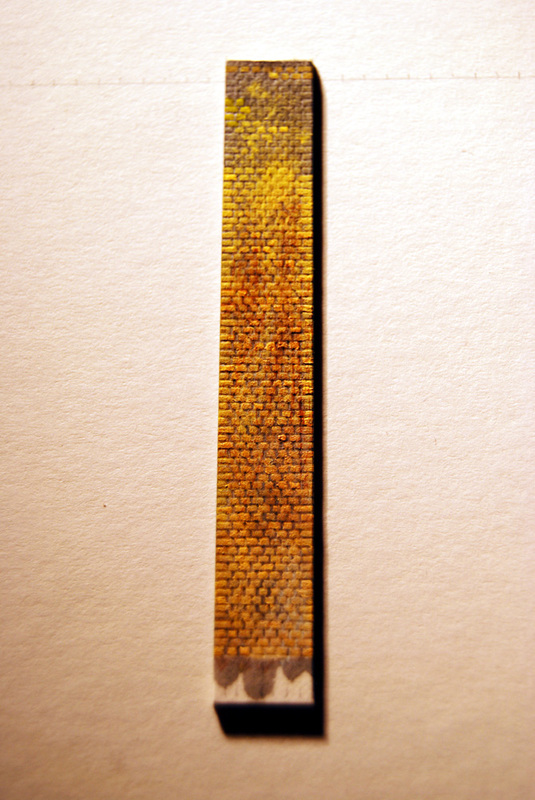 The second problem is that the resultant mixture of yellow paint is always slightly translucent, and does not show up strongly enough when over-painting darker mortar. The solution is to paint the bricks first and the mortar afterwards. The mortar needs to be watered down quite a lot so that it does not modify the colour of the bricks, but will stain the unsealed mountboard underneath. 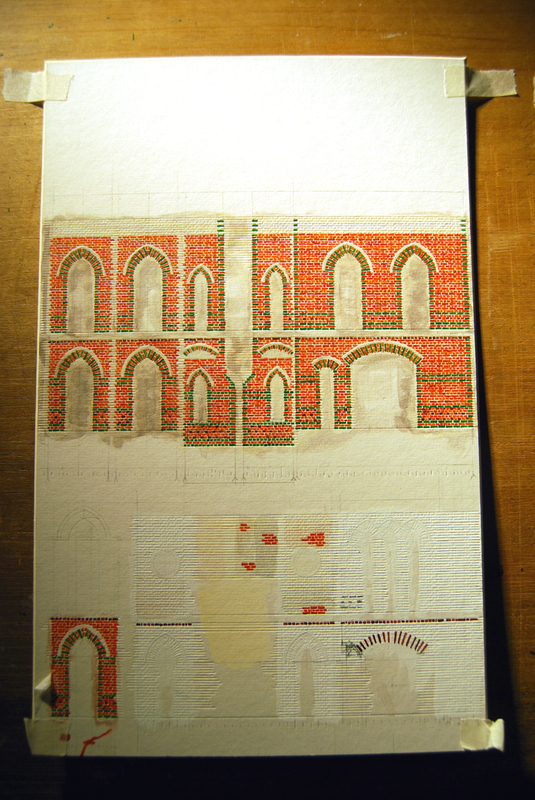 I have also started to layout the arches, a particularly laborious task given that the brick courses are header bond. 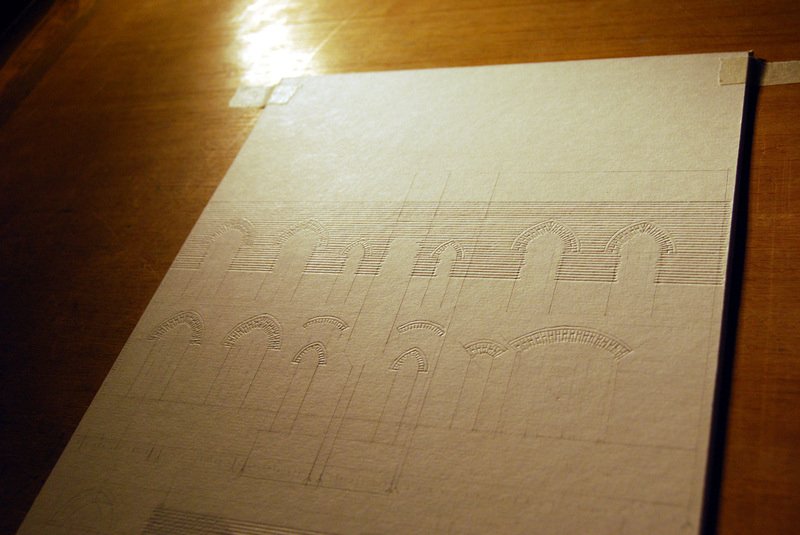 Of course I have again been aided by AutoCAD to accurately and consistently draw the arches. My next dilemma is how to model the top. Various modifications over the years have seen the addition and expansion of a concrete deck to carrying the trains and the loss of the ornate brickwork cornice and turrets that run along the parapet. The whole look and feel of the Stadtbahn was substantially altered too when the Fernbahn (long-distance) tracks were electrified soon after the fall of the Berlin Wall. Due to lack of space on the train deck itself the signalling and catenary gantrys had to be mounted on the side of the stadtbahn again requiring additional structural concrete intervention. They are not visible on the above view as it from the side of the S-Bahn tracks which are powered by third rail. I do not have the luxury of space to be able to model 4 tracks, so my model will not have this distinction. As much as I would relish the challenge of modeling my own electrification, it is not something I have attempted before, and there is much more to do before it becomes a consideration on this layout. My main memories are from the divided Berlin where the Fernbahn tracks only carried the diesel hauled Korridor-Zuge, long before an ICE ever made it to Berlin. There has been some progress on the Post Office, mostly drawing and painting more in the same vein as what I have published already … and just in the nick of time I have managed my monthly update (believe it or not I did start writing this at the beginning of the month, but there have been many distractions, and not much model making)! Post holiday blues? … not a bit of it! I have just returned from holiday in Poland, suitably inspired and ready to crack on with my model making. We only managed one trip by train (to Pszczyna or Pless in German, the home of the Polish Piast dynasty and their large 12th Century Castle/Home), but it afforded me a chance to soak in a little of the atmosphere of the residential tenements backing on the railway that I hope to eventually incorporate into my model railway. It also gave me a closer view of Katowice and Bytom’s industrial decline, not so easily visible from the road. I do not completely intend to capture the feeling of decay evident in Poland, but the architectural style here is very similar to Berlin. Unfortunately due to an accident with a bottle of water damaging my camera, I was unable to take any of my own photos. Mind you had my camera been working, the kind of photography I would have liked to indulge in would still have been difficult with the rest of the family in tow. I was dismayed to discover that as part Katowice railway station’s redevelopment, its unique concrete hyperbolic paraboloid vaulted roof had been demolished. Admittedly although Wiki’s photo shows it in its best light (the dark! ), the station and its environs were in serious need of work. Most people probably thought is was an ugly building, and would not have realized the significance of the structural solution it employed, but it was a notoriously unsavory place to be particularly at night. 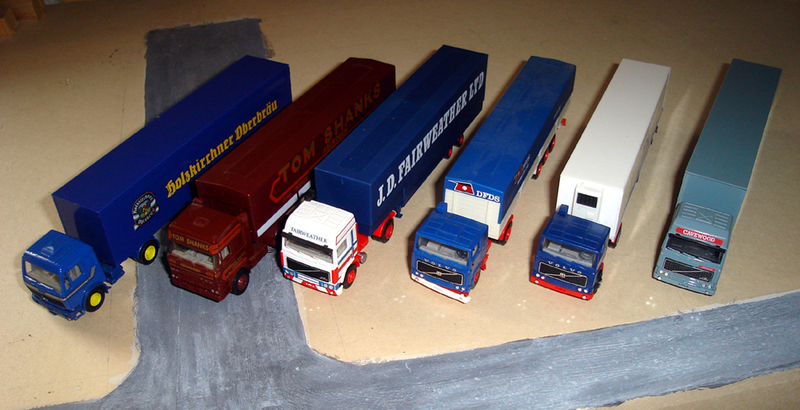 On my return to England I was passing my local charity shop and was pleasantly surprised to find these lorries in the window all for the princely sum of £9. Curiously although they are by German manufacturers (and HO scale rather than the more common British OO) the graphics are predominantly English, yet all but one of the models are still left-hand drive. It was a little indulgent of me to by all of them, particularly as Like most things, there is no shortage of them on my dad’s layout. In keeping with my habit of finding new projects before I have finished the current one, I intend to eventually use these to experiment with weathering and possibly even re-branding with some of my own graphics. A Simon and Garfunkel inspired title to my blog this time! By now you may have noticed one or two patterns starting to emerge! The first being that I have plenty of other things to do that distract me from building my railway, and this month is no exception. Ania is currently in Poland with the children visiting her mother. In theory this would give me more time to devote to my model making, but as ever there is a list of jobs that need doing some of which are only really possible without the family in the way. I also have a recently renewed enthusiasm for riding my bike which is taking a lot of time and energy out of Sundays. 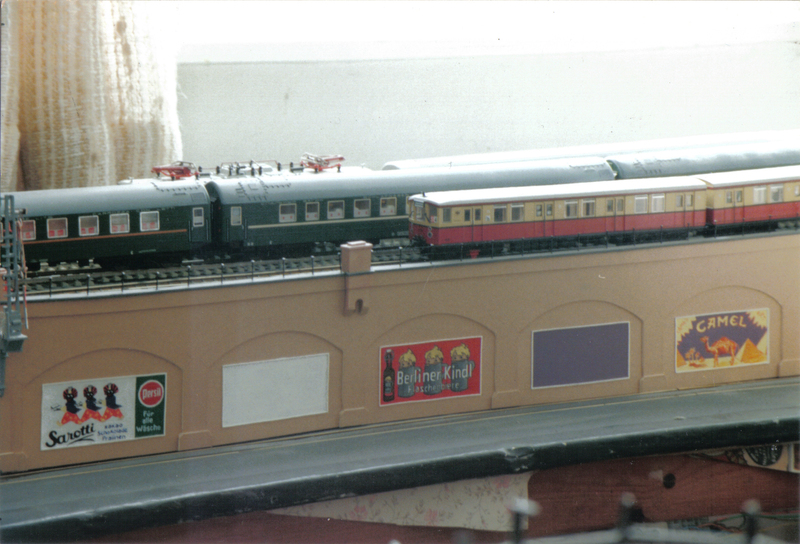 The second thing you may have realised is that even if I have no recent modeling endeavours to update you about, I always have a fall-back plan, in the form of the many models I have created for other layouts in the past. I was determined however this month not to rely on the plan B. I am also off to Poland later this month and I really wanted to have made some progress as there is a chance I may get to visit the original building again. 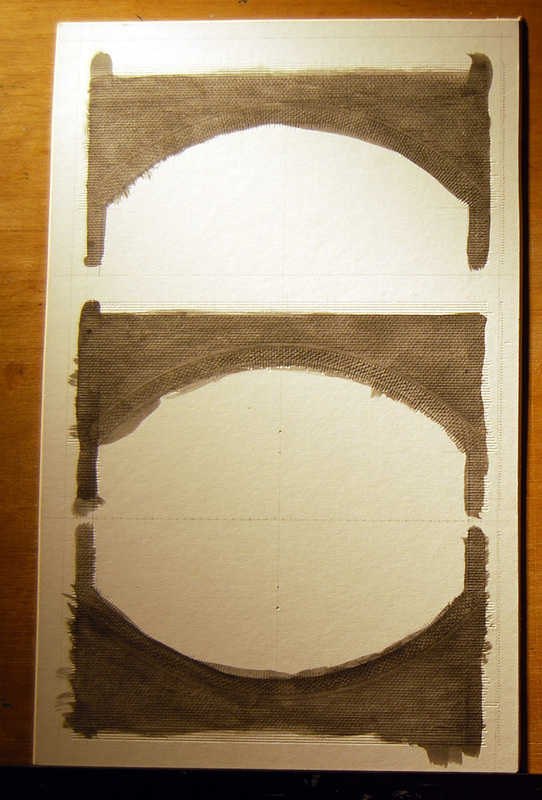 So it is that I have been burning the midnight oil drawing and painting bricks, and this is what I have to show for it. I never said this was going to be a quick, and so far the planning has been one of the lengthier parts of the process. Even on the prototype on a building like this every colour pattern and brick course would have been planned in detail before a brick was ever laid, and just like the original all the dimensions on my model are planned in multiples of brick sizes. Technology has been a great help, I have used AutoCAD to draw and print templates to facilitate the accurate multiple reproduction of the window arches. 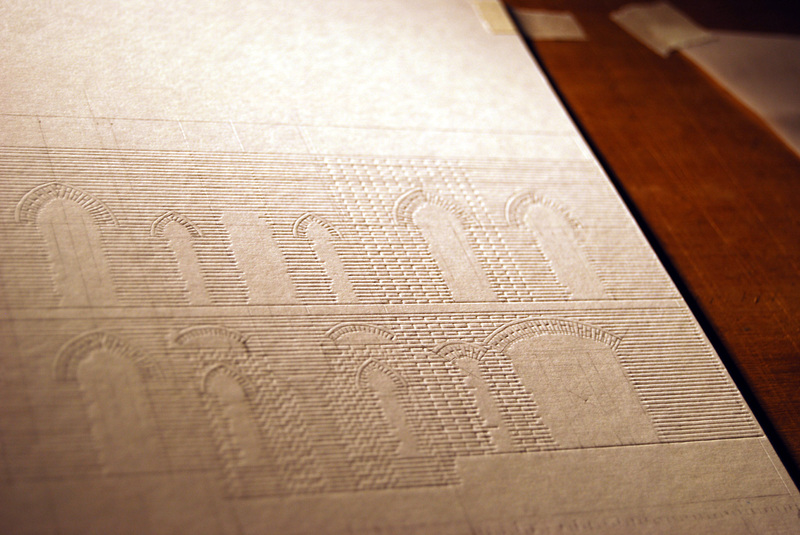 The brick courses are scored into the 1.5mm mountboard using an empty fine Bic Orange biro. The stretcher courses are marked o ut with the aid of a set-square, but the alternate header courses are filled out by hand. The whole area is then painted with a dirty white/cream colour to emulate the lime mortar, before the bricks are painted individually using a size 000 brush. Care has to be taken in the painting to avoid creating noticeable patterns. As the brush unloads the brick that is painted will get lighter. If bricks are painted randomly then the slightly dappled effect natural to brickwork can be achieved, but it is too easy to paint course by course and get a repetitive ‘fade’ effect. This is was not so much a problem with this piece where there are real patterns and the facade is also broken up with lots of windows, but I have worked on models in the past with much larger areas of flat colour. The lower half of the board shows some aborted efforts and colour experimentation (including the original test piece from a few months ago) where I got some of my brick bonding patterns wrong. This is the first of about 3 or 4 sets of wall sections that this building will require. Obviously this is a very slow and laborious task, so expect to read about some of my other models in the meantime before you see any of the below assembled in three dimensions. With the arrival of my second daughter Sarah, I have been able to take some time off work to help look after her and her mother (and my other children). Now in an ideal world this should have given me more time to work on my model railway also. In reality things have been a little different. There has been an increasingly long list of jobs that need doing around the house: things that need fixing; cupboards, drawers and piles of rubbish that need sorting out; all the sorts of things that get left either until they can absolutely no longer be ignored or you have your wife nagging you saying you are not going to waste these two weeks at home doing nothing. To be fair to her Ania has done a serious amount of work herself these last two weeks. The birth was quick and without complications, and both mother and daughter have been doing very well. Ania has been reveling in her new found freedom and would not be told to sit down and take a rest, and has been tackling in earnest all the jobs she was unable to do towards the end of the pregnancy due to lack of mobility. So it is that I have had a productive couple of weeks. All the mundane but necessary administrative tasks relating to Sarah’s arrival have been dealt with such as birth registrations, passport applications and tax credit applications. The car insurance renewal has been sorted and one of next years holidays booked. July is also a very busy time in my family for birthdays, and we have even managed to squeeze in a University reunion. To add to all this I now also have a tidy and organised toolbox (or 3), 4 clean bikes, a clean and vacuumed car, a very tidy and clean wardrobe and a large pile of rubbish waiting to be taken to the tip. It is this last one (the pile of rubbish) that has got me thinking. As humans we have a natural tendency to hoard. Obviously this affects people to differing degrees. Some people cannot live with clutter and are better at throwing old useless stuff than others, while some of us think ‘I will just hang on to that it might be useful someday.’ It is when you find the box in the loft or the cupboard under the stairs that has not been opened for 10 years that is full of rusting, corroding, obsolete, and outdated odds and ends that you realise something needs to be done. ‘Life laundry’ I think is the modern buzz-word for this kind of activity. Ania is much better in this area than me, however a look in the basement of her parents house in Poland will show you that she is not completely immune to the accumulation of clutter, but I think I suffer worse than most. My dad is fellow subject of this condition which he thinks is a reaction to his austere upbringing during the war, but I think it is more fundamental than that. I think we are genetically programmed to want to hold on to as much stuff as we can. For much of human history the common person has not had much in the way of possessions or means to look after what he had, so anything he did have was precious. The Twentieth and Twenty-first Centuries have seen an explosion of both global wealth and the relative wealth of the average person. Even relatively rich people for the most part do not feel secure and are always looking for more. This hoarding tendency is also reflected in our biology. We are naturally programmed to like fatty sugary food and store it in our bodies. for a long part of our evolution this food was rare and we learned how to make the most of it. Now this kind of food is a lot more freely available and we eat too much of it, this is why obesity is on the increase. The evolutionary mechanisms that govern these impulses, conscious or unconscious, physical or psychological, will take a long time to catch up with the technological advances that have shaped the world we live in today. The alternative view is that God made us this way intentionally, but also gave us the willpower to over come it should we want to, but to start this discussion would be opening up a whole different can of worms, one which is not on today’s menu. By now you will be asking what, apart from distracting me from it, has all this got to do with my model railway? Another natural human impulse is to collect, sort and categorize everything what we find the world around us; what I call the train-spotter instinct. This coupled with the the tendency to hoard and keep stuff ‘just in case it might be useful‘ is an essential part of the make-up of a good model maker and rail enthusiast. Some people think our hobby strange and cannot understand what we find interesting. I think it is only a natural extension of our human nature. Nearly all interests and hobbies are based on the same thing, it is only the subject matter that changes. Scratch building, the skill of making models without the aid of kits and instructions is seen as the epitome of model making. Very few people learn how to scratch build without going through an apprenticeship of kit building and then progressing onto something called kit-bashing before becoming a fully fledged scratch builder. It is this intermediate step of kit bashing that is the most interesting, This is where the real skills of model making are learned, and scratch builders never really leave it behind. To put it simply kit-bashing is where you start off with one kit and mix it with bits from another to make something new and different to what was originally intended by the kit manufacturer. It is at this point that bits from the original kit will be left over, so rather than throwing them away they are kept ‘just in case‘ they become useful on another model. So any kit-basher will soon build up a whole supply of odds and ends of old kits. Somewhere along the line in a kit bashers career he will find he does not have a suitable bit for a particular model, and he then has to make it himself or incorporate something that is not from a kit! He has taken the next step in becoming a scratch builder. While there are many commercially available products to aid the scratch builder a good scratch builder will not limit himself; almost anything becomes a legitimate sources for model making materials. Anything from old paperclips to plastic tray inserts from chocolate boxes are kept and st ashed away to be used on a rainy day. 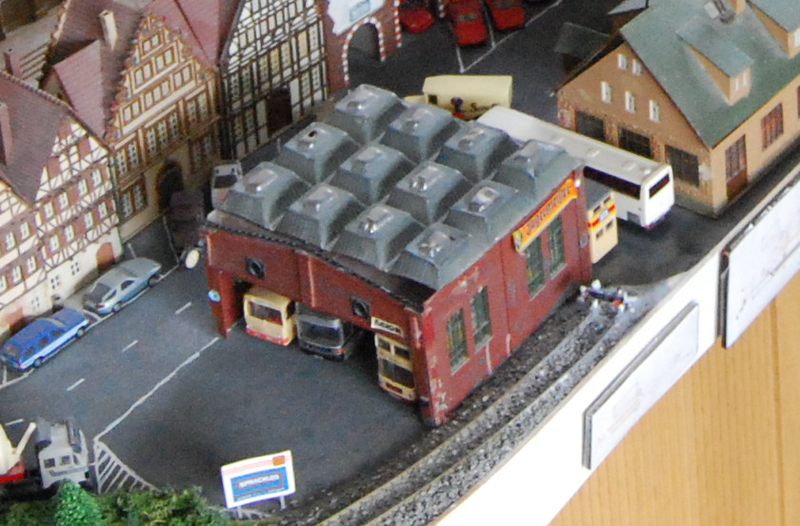 Here is an example of one of my dad’s kit-bashed buildings, a bus station, made from the leftovers of joining together two Vollmer 3 road roundhouses and a chocolate box insert masquerading as a space frame roof. 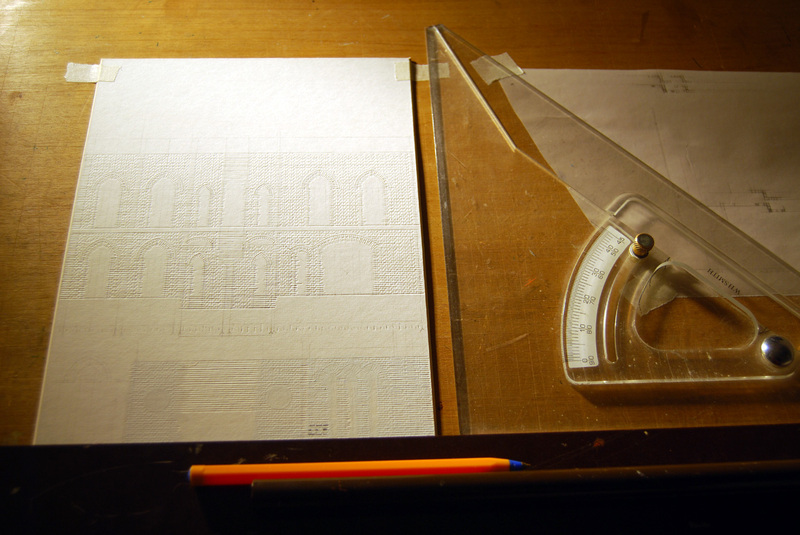 Through my model making experiences during my architecture degree I kind of skipped the true kit-bashing stage. I do however have a shoebox full of old bits and stuff that I have accumulated over the years that I hope will one day become useful, and I do not consider the recycling of old kits in my own models beneath me. The following photographs are of one of the first models I was truly proud of and one of the few examples of the reuse of other bits. The balustrades to the subway stairs where once openwork girders holding up the roof of the previous platform canopy. The platforms I built myself, tailored to the trackwork, and the canopies follow the Y-shape that I am sure is familiar to the users of many German railway stations, as should be the DB Era V colouring and signage. This model was built to try to capture what I had experienced on so many family holidays as I was surprised and disappointed that most of the ready made kit platforms followed rare or outdated prototypes. In the background of this photograph you can see my mum and dad’s wardrobe doors! 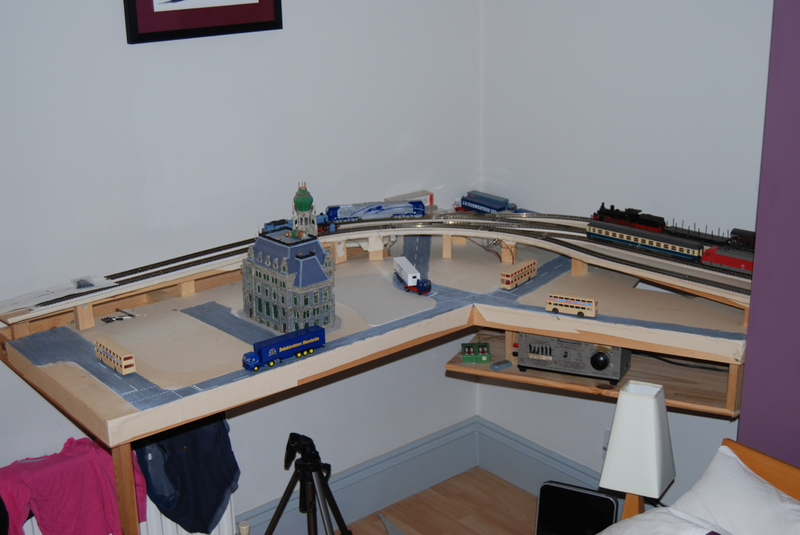 I am not the first, and no doubt not the last person to ever build a model railway in their bedroom. It is getting towards the end of the month again, and I have not posted! I did say at the end of my last post that I needed to do some model building if I was to have something to write about, well progress has been very slow. The essence of the building I am working on is the brickwork and the patterns in the string courses and the lintels. It has been proving quite tricky to work them all out satisfactorily and at times I am getting hamstrung by previous decisions. In truth I was not really expecting to get very far, and not just because of the difficulty of what I am doing. I have been a little distracted (again). My wife is currently expecting our third child, and I have spent the last 3 weeks expecting to have to rush her to the hospital at a moments notice. I should really have done this earlier but I am now executing the fallback plan (which I had all along); writing about previously completed projects. This is not the first time I have built a model based on the Berlin Stadtbahn, so here is a little evolutionary history. My dad had always built his layouts with trains on two levels, with the upper level running on stilts above the lower level, often with sidings for storing extra trains. While I always enjoyed the variety of operational possibilities these layouts offered, I was never entirely satisfied with the aesthetics. There have been a few previous attempts from my earlier teenage years of building a ‘wall’ to conceal the lower level. 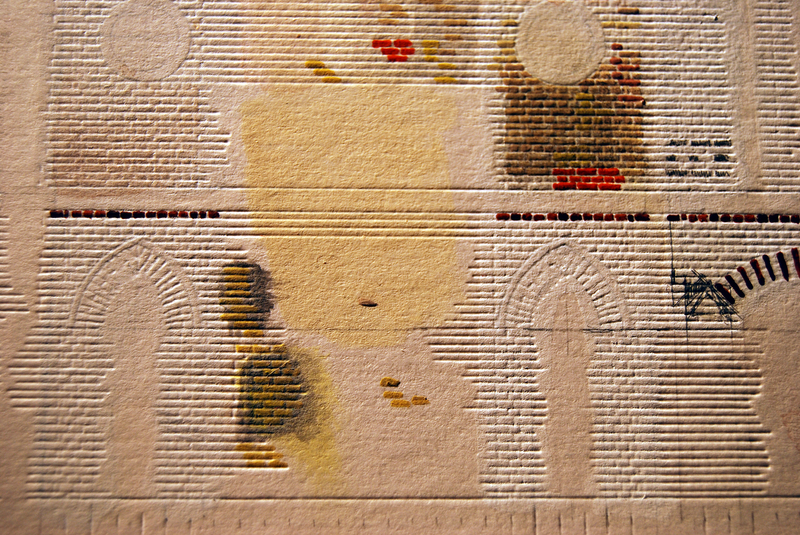 The first attempt was made from breakfast cereal boxes painted grey with stonework drawn on with a black felt tip. Fortunately there are no surviving pictures. It was hardly the pinnacle of my model making career. The sections were very short and the joins were not very good, and I quickly become lazy and the stonework was very inconsistent, let alone realistic. The second attempt aimed at more uniformity. This must have taken a while; even just collecting my raw materials was a drawn out process. I restricted my self to one brand of cereal boxes, the only one with a grey inside to eliminate the need for painting. 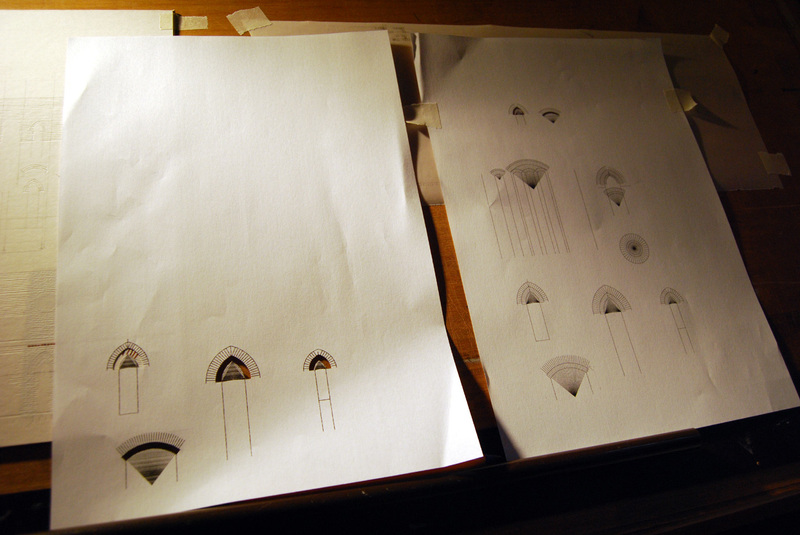 I was then more meticulous with the drawing of the stones. While still not particularly realistic, it did give a more pleasing effect, but it was not without its problems. Joins still were not very good, although I did cut the boxes up differently to minimize their number. Durability was the second problem; the wall often needed taking down for track/turnout maintenance, to correct derailments or to rescue trains that were stuck on dirty track. 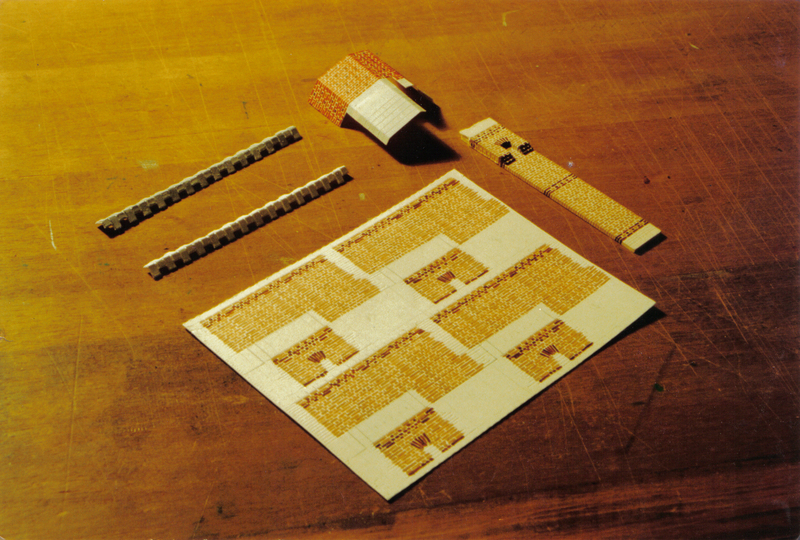 The wall was only held in place by track pins, and these had a tendency to punch through the cardboard. 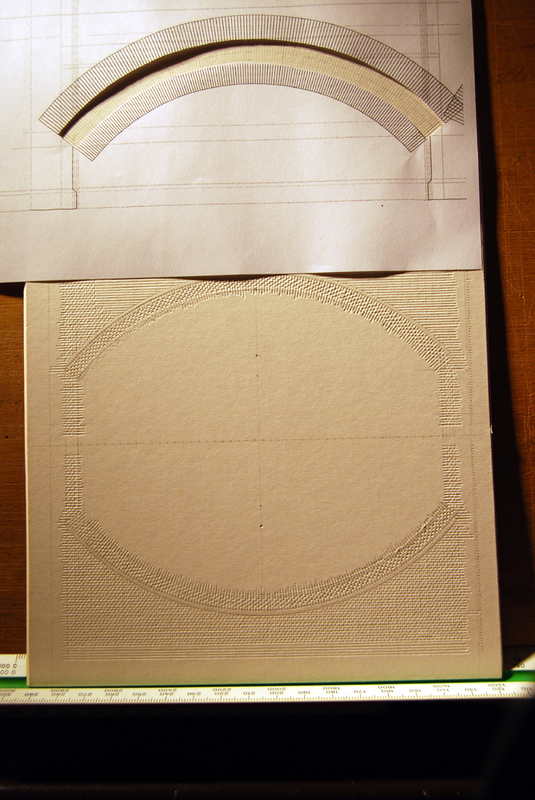 The corners and intermediate fixing points soon became perforated by lots of holes. Architecturally it was very monotonous and did not really follow any realistic precedent. It was after this that we started to visit Berlin regularly on holiday, and I eventually realized that I had a legitimate prototype on which to base my wall. We decided at one point to rebuild nearly the whole layout in order to address some of the operational issues, and the old grey wall was never reinstated. 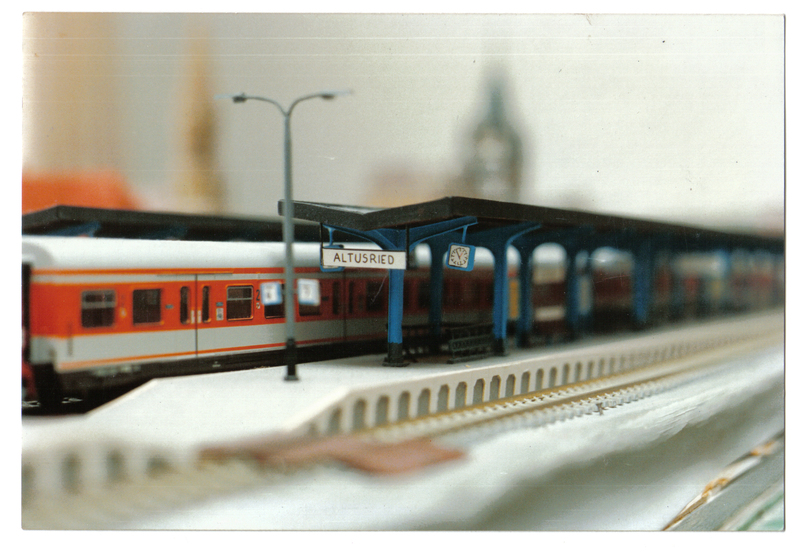 Here is a picture of my first attempt at modeling the Berlin Stadtbahn, complete with a 1930’s S-Bahn unit. This must have been from about 1991, after my first year at architecture school where I discovered the joys, of modeling with mounting board. My thinking had matured on many levels, and I was able to use architectural features to assist in solving previous problems. For example piers are used to conceal joins between sections, and intermediate turrets to hide extra fixing points. The thickness of mounting board add a lot more rigidity and durability to the design and also made creating relief details such as piers, flared bases and indentations much easier. 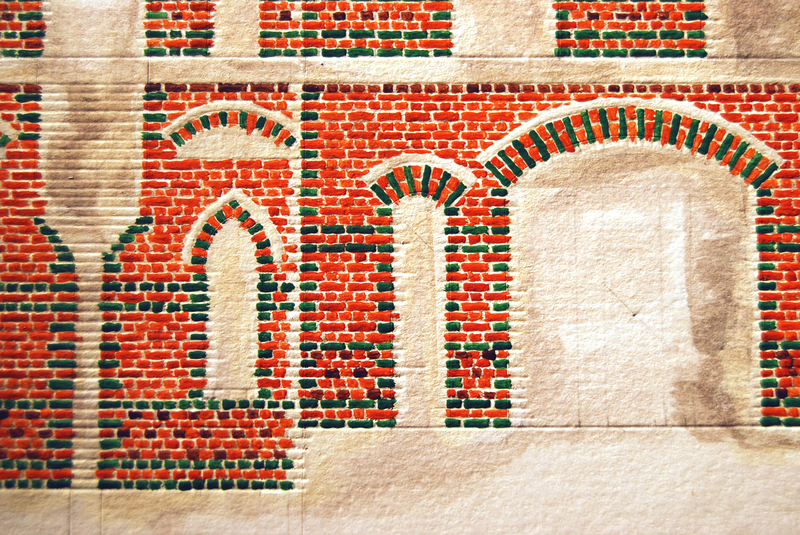 At this stage I did not go to the extent of painting individual bricks, but I was keen to reproduce the overall effect of railway arches and associated paraphernalia. Similarly to in this country, the railway arches underneath the Berlin Stadtbahn are home to all manner of businesses, bill-boarding and graffiti. 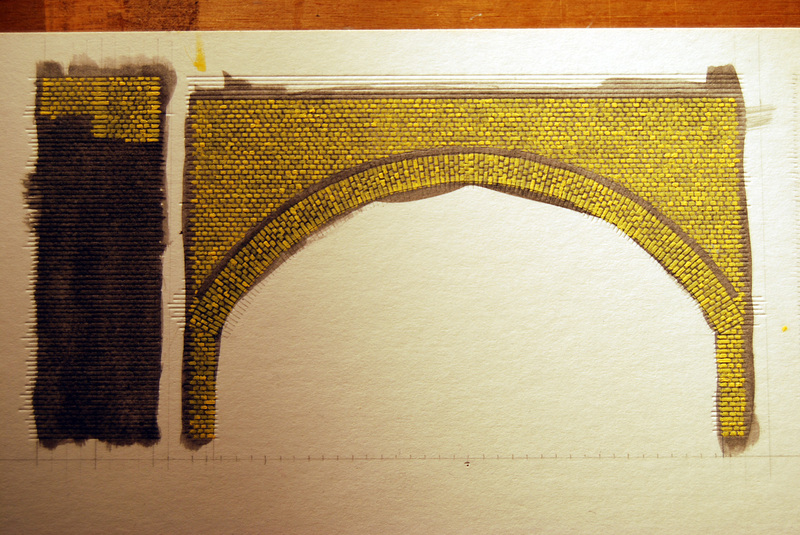 I did not go as far as reproducing the graffiti, but I did try a variety of ideas to infill the arches. Here are some examples of hand painted billboards. Some arches were left empty to act as road bridges through the Stadtbahn, and also acted as service points to the trains underneath without having to always dismantle the wall. 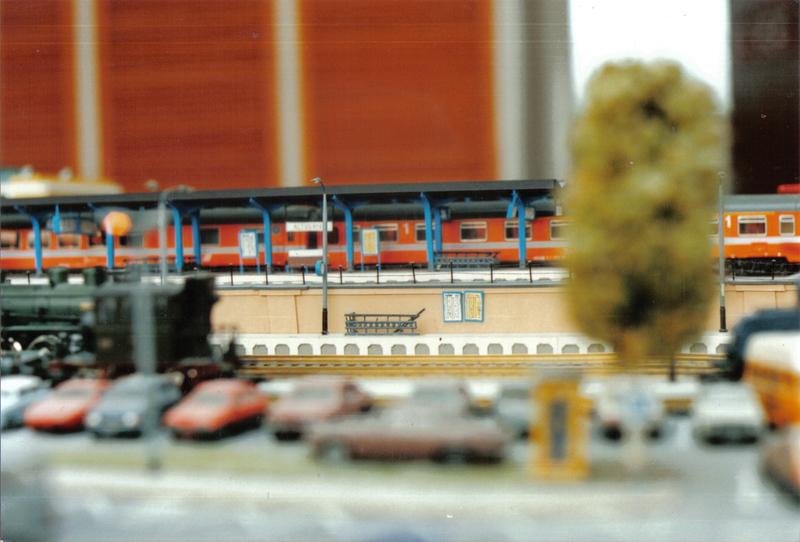 The buildings behind the stadtbahn are much later additions, and I hope show a development of my model making skills. They are also typical of Berlin apartment buildings, and represent another of my interests, I want to say early 20th century graphic design, but the Coke advert is of a particularly late 20th century vintage. These kinds of murals are often found in this context, and the guy holding the beer glass is doubly apt as this is the logo for Schultheiss, one of the local Berlin breweries, and was copied off a beer glass. I have always had a particular skill for facsimile, rather than original thought which is probably why I was never going to be as good I would have liked to be a successful architect. 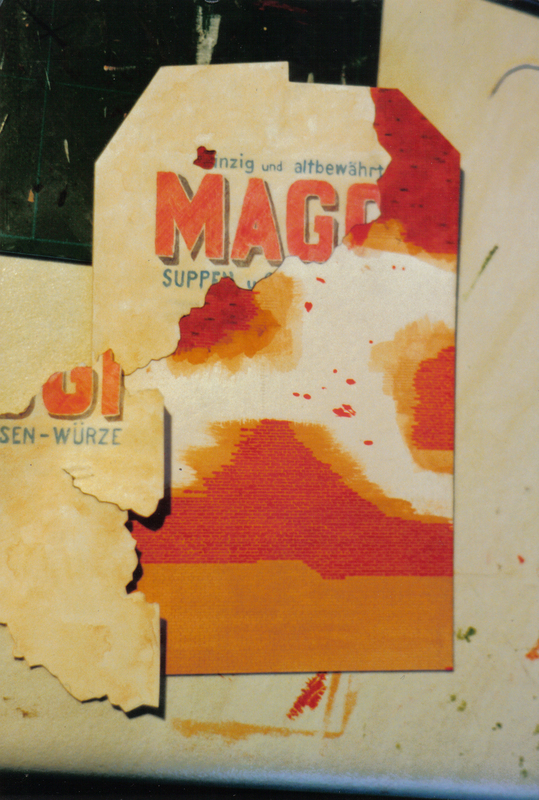 Here is a close up of the Maggi advert under construction. I have now taken the plunge and decided to start drawing individual bricks, and trying to create an authentic weathered finish. 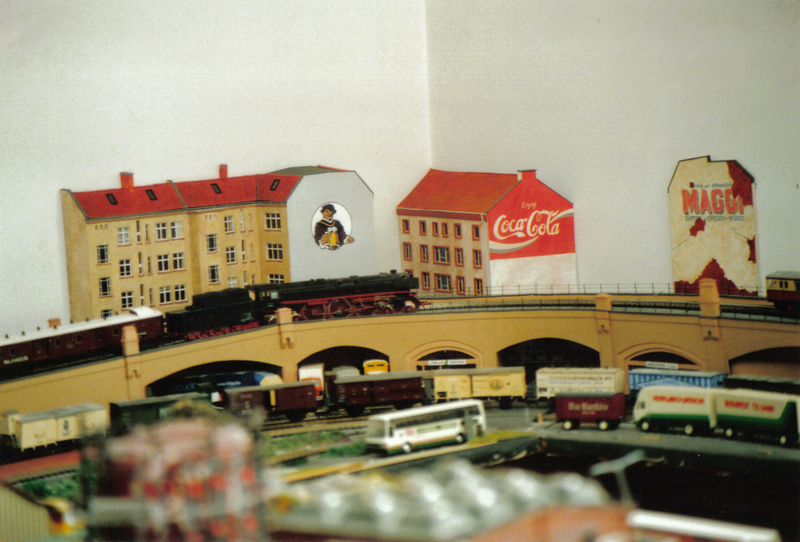 While this incarnation was the most complete, including railings and a far side, it was not the final version of my ‘Wall.’ I do not have any pictures to hand of any completed parts insitu, but I did start and almost complete a second version of the Stadtbahn where I painstakingly painted all the bricks. Unfortunately the layout was dismantled before I could finish what was possibly a slightly too elaborate cornice detail, but parts have been used by my younger brother when he rebuilt the layout as a part of his rehabilitation after suffering for more than a year with ME. I will have to publish some photos of this layout as part of another blog. 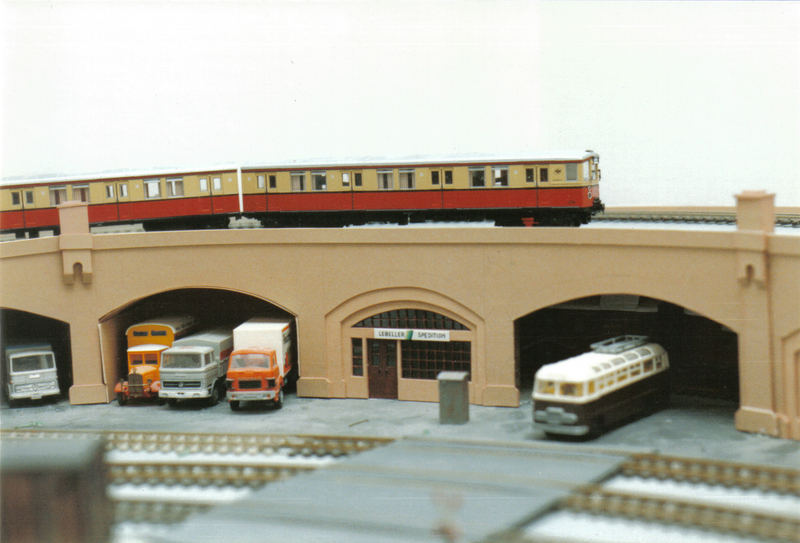 While writing this entry and scanning the relevant photos, I have scanned quite a few more photos of the old layout that I have not included here, showing examples of some of my other models. So while progress may be slow on the current project, I do not have any excuses for not having anything to write about next time, and with any luck you may not have to wait so long for the next installment. Just in case you were wondering I have deliberately avoided any music references in my blog title this time, and there were a few possibilities along the Pink Floyd/Roger Walters axis. For the very eagle-eyed, there is an allusion to a long defunct BBC2 music program. Unfortunately there are no prizes for spotting it.